After an exciting twittersation between Andrew Brown and Tom Barrett reported on David‘s blog EdCompBlog: Can you guess what it is yet? and Ollie’s iPhone posts (starting with iPhone in Education – Introduction) I was keen to try out gps drawing with my class. SnailTrail records your gps position and saves it to a list, you can add a name to the point and date and time is recorded. The list can sent via email. The points are saved until you delete them. The email arrives with a simple list of points, a second list with names you added and date time and a link to a simple kml template. You can download then open the template, in a text editor, paste in your points and see the trail in Google Earth by opening the template file. 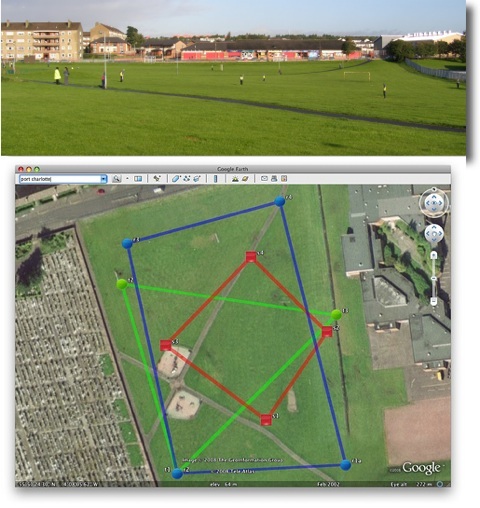 On Tuesday last week I had a few early finishers in Maths draw some 2D shapes onto printouts from Google Earth, of the park next to the school. On Wednesday I split the class into groups, issued colour coded gym bibs and explained that they were challenged to make a shape on the park. We talked over some ideas for making straight lines and figuring out where they should be on the map. The children then scattered very quickly indeed, splashing round a rather wet park. Once they were in position I walked round gathering the locations on my phone. I had planned for one child in each group to run round recording but the field was so wet I though it better to keep them still. We emailed the waypoints to my email and returned to school. A quick paste of the points into the template showed up a few flaws in my implementation. I had not collected the points in sets of shapes, rather just walked down the field, so they points were all mixed up. The template was designed to show a simple trail rather than shapes. I took the points and template home and played around a bit, the above screenshot was the result, our five pointed star was a bit of a mess so I left it out. 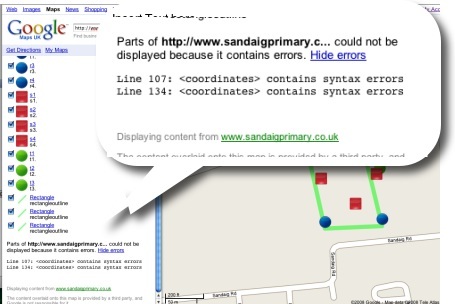 This morning I tried opening the template via google maps, and it showed a couple of errors. I had another wee dig around the file and now have one that shows up correctly in google maps. I found it a bit tricky to fix as updating the file did not update in google maps, I had to rename the file with each test to view the results, I have got a lot to learn about kml files. This is a pretty nice lesson, you can cover quite a lot in it. The properties of shapes, this challenges children to really understand these, working as a team, problem solving, co-ordinates, and a way to introduce latitude and longitude. The children really enjoyed it. You do need to organise a few things, I had a PSA and link teacher from our local secondary with me, neither had very suitable footwear Next time I’d record the shapes in order and have a template ready to draw the planned shapes as soon as we came back. Tom Barrett has started a flickr group LearningTracks for sharing ideas about using tracksticks and other gps devices to draw on Google Earth.